Vetlicious is a complete vitamin and mineral supplement for dogs to make home cooked pet food easy and affordable whilst ensuring your pet is getting a complete, balanced diet. This product is the brainchild of Dr Steve Denley, a small animal veterinarian with over 20 years experience. Over the years, he noticed that many pets' ailments and overall health improved after switching to a home cooked diet. However, many owners like us get frustrated by the complexity of trying to provide a truly balanced diet - one that contains the correct amount of vitamins and minerals. We came across this new supplement a few months back but decided to wait for the colder weather to set in as it is more conducive to cooking for our dogs and ourselves! 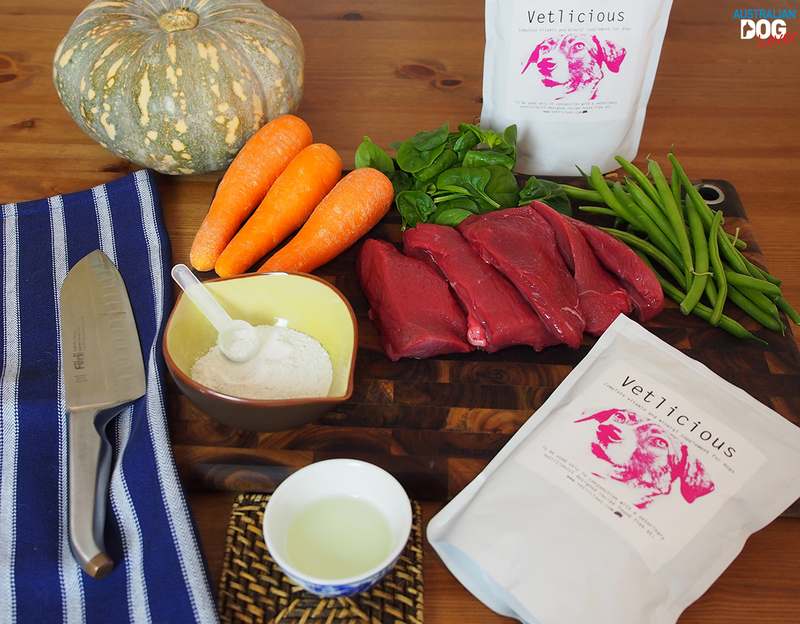 What is in the Vetlicious supplement? Just like our own diet, the nutrients that are needed to keep a dog healthy include basic protein, energy, vitamins and minerals. In the long-term if these nutrients go below or above the required levels, this can result in an imbalance and possibly lead to anything from a mild illness to death. 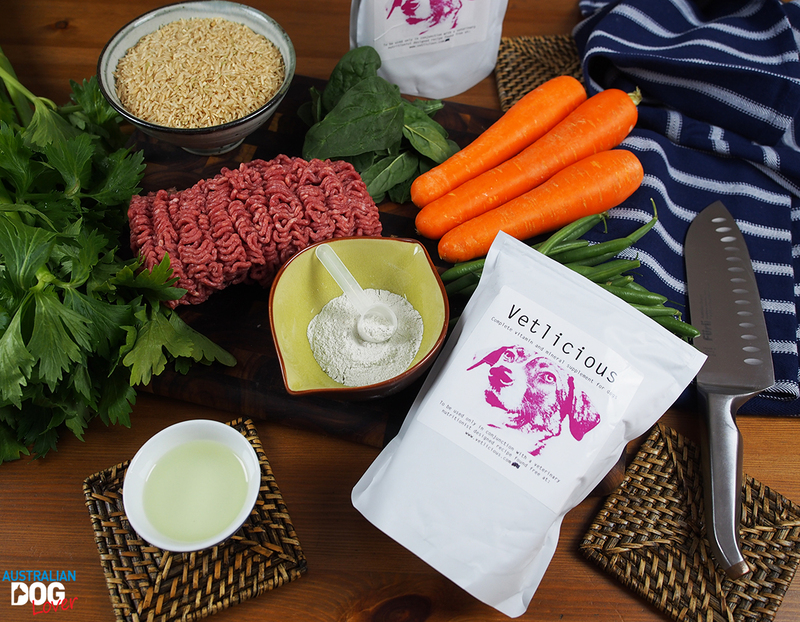 Vetlicious was carefully designed by veterinary nutritionists to be used in conjunction with some specific recipes to meet the (minimum) standards set by AAFCO (Association of American Feed Control Officials). It comes as a white powder which has a minimal but pleasant odour - for better pet acceptance - and is designed to be easily mixed with your dog's home cooked meal just before serving. It contains carefully selected hypoallergenic ingredients with a chick pea protein base, ideal for elimination diets. An elimination diet is a short-term eating plan that eliminates certain foods that may be causing allergies and other digestive reactions - then reintroduces the foods one at a time in order to determine which are / are not well tolerated. It is primarily used for pets with skin conditions and/or gastrointestinal issues. Kangaroo and Emu are novel foods that most dogs are unlikely to have eaten before (or in small quantities) so these two recipes are recommended for an elimination diet. Strict adherence to the diet for 6-12 weeks is needed for the trial to be valid. This means that all other proteins in the form of treats or even flavoured medication (e.g. beef flavoured heartworm medication) should be avoided during that time. How to use your Vetlicious supplement? 1. The first step is to visit www.vetlicious.com and choose your protein (Beef, Chicken, Kangaroo or Emu) recipe. 2. You will need to enter your dog's weight and body condition, level of carbohydrates and finally decide how many days you'd like to prepare meals for. 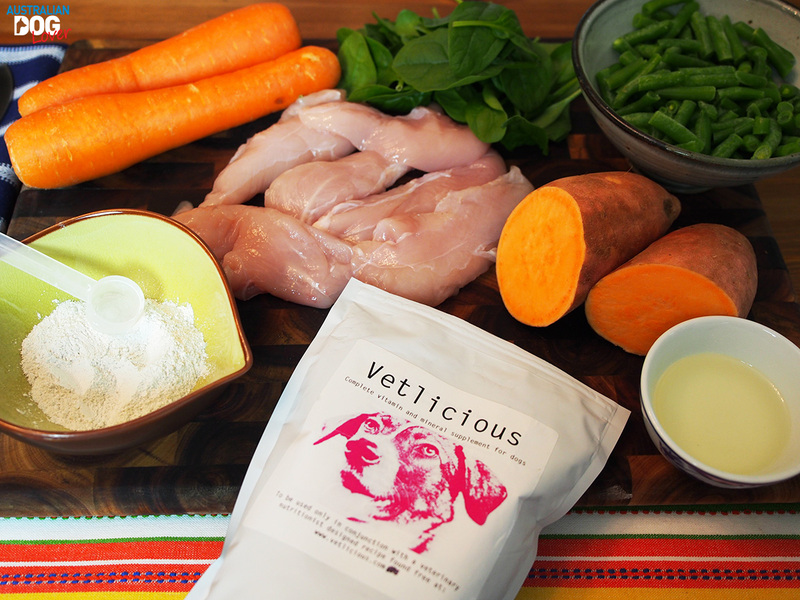 The Vetlicious calculator will work out how much of each ingredients is needed and also how much supplement to add daily - this varies depending on the recipe. Each of the proteins contain varying amounts of nutrients themselves, which of course varies the amount of Vetlicious required to achieve the same overall balance within the diet. e.g. beef (and lamb) is low in sulfur containing amino acids compared with other meats. When cooking in bulk, you'll need to freeze your meals separately and ensure each portion is thawed in the refrigerator for 24 hours, before warming at least to room temperature to serve. 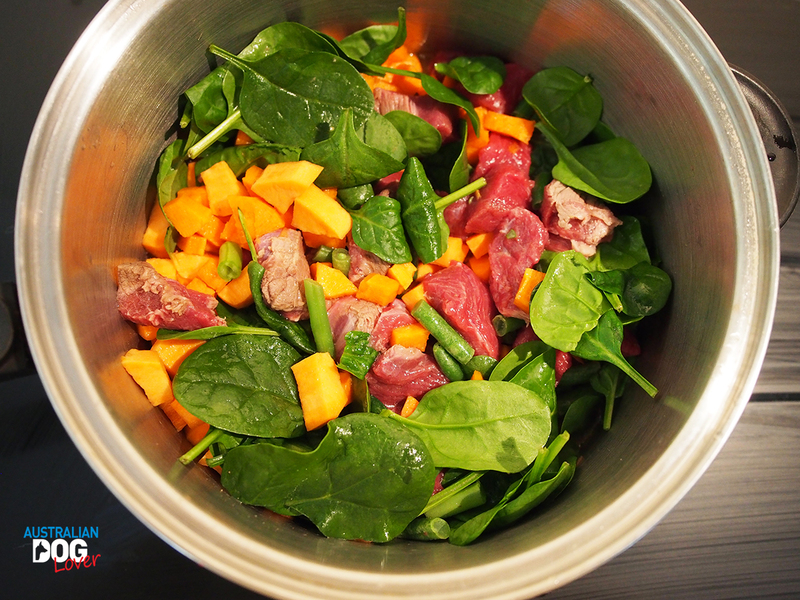 As with any changes, you'll need to transition your dog slowly to this new home made diet. The website recommends starting with 50% existing diet and 50% home-cooked meal for at least one week before transitioning to a 100% home made diet. If your dog suffers from medical conditions, always speak with your own vet first to ensure a diet change is appropriate. 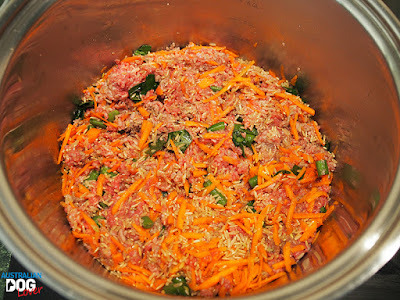 Personally, we decided to trial these recipes with our senior dog Conner (12 years) for two reasons: mainly to boost his immune system but also to hopefully assist with the first signs of arthritis as we noticed he was really slowing down this winter ... Not knowing if he'd go for a home cooked diet, we opted to prepare meals only for 3 days at a time. Over a 4-week period, we tested three recipes (Beef, Chicken and Kangaroo) and found them very easy to cook and they worked well as a maintenance diet (our dog having no special skin or food allergies). Emu is proving a bit tricky to source but we're keeping an eye out! We cooked our first meal using premium kangaroo fillets however we easily found some quality human-grade roo mince which works out cheaper and saves on prep time. Despite getting on in years, our dog is not in the least bit fussy but this Kangaroo recipe was by far the most popular! Adding the Vetlicious supplement at both breakfast and dinner time was easy enough to remember after a couple of days! Bearing in mind that we used this supplement only for one month and with one dog, this is not a clinical trial so it's honestly difficult to say what impact it had in the short-term. Correlation is not causation! Probably the one thing we did not fully agree with is the cooking method of 'boiling the ingredients separately'. You can be really flexible with your choice of non-starchy vegetables (green beans, spinach, broccoli, carrots etc.) as long you use the overall weight as per the recipe. The cost will obviously depend on your choice of protein, whether you opt for organic sources and if you shop at the wholesale butcher or the supermarket but Dr. Steve Denley advised the average cost of feeding a 20kg dog on a Vetlicious recipe (incl. supplement) is around $20-25 per week. We will definitely give this Vetlicious supplement another full month's trial after a short break and will keep monitoring Conner's progress during that time.